Historically, while not ideal, WANs met the needs of the enterprise as many mission-critical applications were deployed locally, and WAN-based applications were best effort in nature. Today, the model has changed. Companies are adopting network-centric compute models such as cloud (Exhibit 1), mobile computing and the Internet of Things (IoT), which raises the value and importance of the corporate WAN. In addition, the significant rise in video, VoIP and virtual desktop traffic drives the need to evolve. As application performance becomes more dependent on the network, application delivery requires IT to be more network centric. For this to happen, the network must shift from a tactical resource to a strategic asset that will play a key role in IT success. 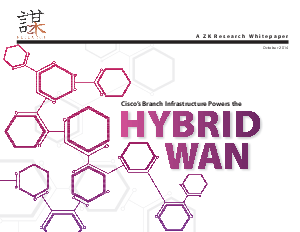 However, for the WAN to achieve this level of strategic importance, it must evolve into a hybrid WAN.